Orange, red wine, and cinnamon come together in cuddrireddra, an Italian deep fried cookie that resembles a biscotti in texture. Don’t let the frying scare you off. Everyone was surprised to hear that the cuddrireddra were deep fried – unlike donuts or funnel cake, they are not at all greasy. 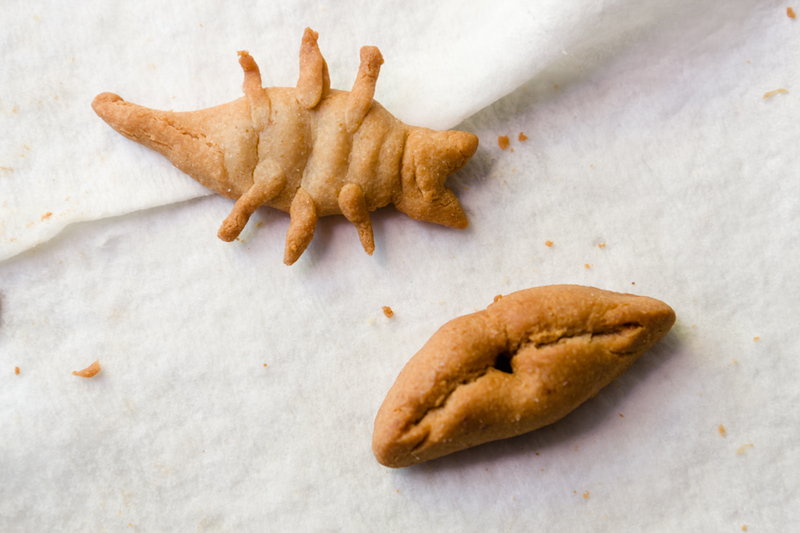 The cuddrireddra have a respectable crunch without being rock hard and the flavor is unique but comforting at the same time – like the smell of home cooked food that sometimes fills the hallways of apartment buildings. One taster couldn’t help but remark over and over again that cuddrireddra are much better than chocolate chip cookies. It’s no surprise that she felt that way; cuddrireddra are the cookies that were worth tracking down for four years. I wanted to make wagon wheel cookies to serve with my Wild West cupcakes for Wild West week. With a quick Google search, I learned that there is a packaged wagon wheel cookie that is sold in Australia, Canada, and other parts of the world where I don’t live (I know that some of you live in these places. Have you had them?). These wagon wheels are chocolate covered wafer sandwiches with marshmallow filling. Other than being circular, they don’t resemble wagon wheels to me. So, I dug deeper. 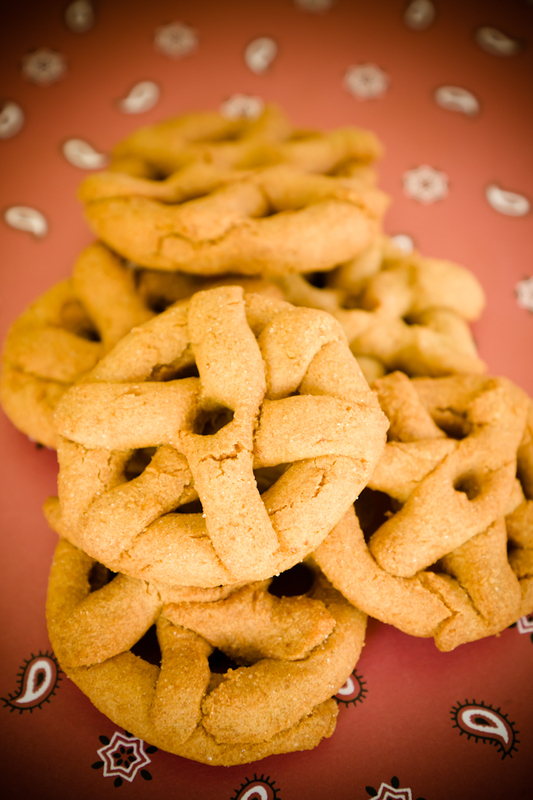 I am looking for a recipe for an Italian (from Sicily, I think) Christmas cookie recipe. The cookie is made from a very hard dough, kind of like biscotti dough. It is a basic dough with cinnamon. The dough is rolled into a long strip and then intricately twisted round and round to form a wagon wheel. Onto this round wheel is pressed flat pieces of dough (which would almost look like hubcaps). The baked cookies are crisp and hard – you can break pieces off for dipping in coffee or wine. I know this sounds unusual, but it is the only way I can describe the cookie. The cookies are delicious with coffee, but also very good with vin santo or other sweet wine after a meal. I have had them many times – used to be able to buy them at a bakery (Tre Maria) in Toronto, but they are no longer available there – very labour intensive. Any help would be appreciated. thanks. Note the year: 2006. Read through the whole thread if you’d like. It’s fascinating and filled with kind responses from a supportive and culinarily informed community trying to help Tartetatin find her cookies. But for those who don’t want to read over eighty posts, I’ve collected the highlights. 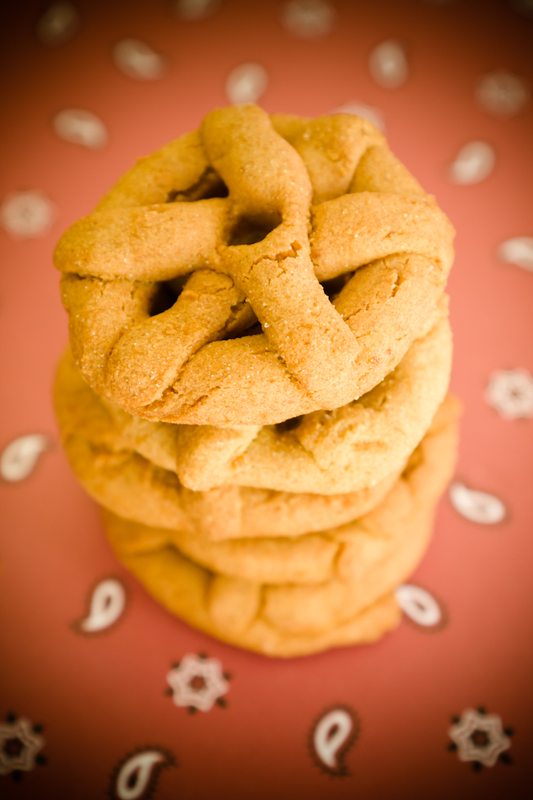 In the Slowfood Dolci book, there is a recipe, with a picture for a cookie called “Cuddrireddra” It is ring shaped, with a twisted layer under and a snake/flat ring on top. This sounds very much like it could be your recipe, or similar. The book says its from Delia, a farm town SW of Caltanissetta and made generally during carneval period – the name means “coroncina” in the sicilian dialect.the dough is made with farina di grano duro tipo 0, baking powder, strutto, sugar, a fresh egg and red wine; “its all perfumed with cannella (cinnamon) and citrus peel. If you read italian, I will post the instructions for forming the thing. And then, it took Tartetatin almost a year to see Jen’s response! The saga then continued because the Slowfood Dolci book had just the ingredients and the method, but not the quantities. The Chow forum members then began the hunt for the recipe. Almost a year later, a reader named Robert found the recipe in Italian on CookAround. well and also the translation from italian into english…..maybe some other amazing person can take on that task and post it for all of us to try……….once again,,,,great job!!! Robert went on to translate the recipe (and we learn that Tartetatin had also found the recipe independently and had done the same thing). In 2010, four years after her initial request for the recipe, Tartetatin made the cookies for her family at Christmas. Hello all,I made the cuddriereddra!! I LOVED them -they were just as I remembered, however, they were a lot of work. I had to knead them forever. I am very pleased with the result though and made a huge batch as I knew that I would not make them again for a long time. They keep very well. Imagine a hard cookie (somewhat biscotti like in texture but harder and much more delicious) with cinnamon and orange zest and dipped in espresso. They are exactly right. Thanks everyone for your posts and your encouragement. These will be a yearly endeavour, up there with my canned tomatoes and homemade salsa. Thanks again. I wanted to keep my cuddrireddra as close to authentic as possible. I used the recipe that Robert found on CookAround. The main changes that you’ll see in my description are a a major scaling down in size (look how huge the ball of dough is on CookAround), a conversion to U.S. measurements, and cosmetic changes (I didn’t have the special shaping tools that you see on CookAround and I wanted it to look like a Wild West wagon wheel). It tickles me that my silly quest for a Wild West week wagon wheel cookie led me to such an endearing story about an Italian cookie. I’ve loved sharing the story with you, and I hope that Tartetatin’s cookie sleuthing may lead to a new holiday favorite for your family. Note: This recipe calls for durum wheat flour. Durum flour (which is not the same as semolina) is not something that is easy to find. If you can’t find it anywhere near you, you can buy durum flour online . I’m sure that you will want to know if you can substitute another kind of flour. The answer is that I don’t know. I wanted to make it as authentic as possible, so I used the durum. If anyone tries this recipe with something else, let me know how it turns out. Orange, red wine, and cinnamon come together in cuddrireddra, an Italian deep fried cookie that resembles a biscotti in texture. Knead 3 1/2 cups of the flour together with all of the other ingredients (except the vegetable oil) by hand or using the dough hook of a stand mixer. 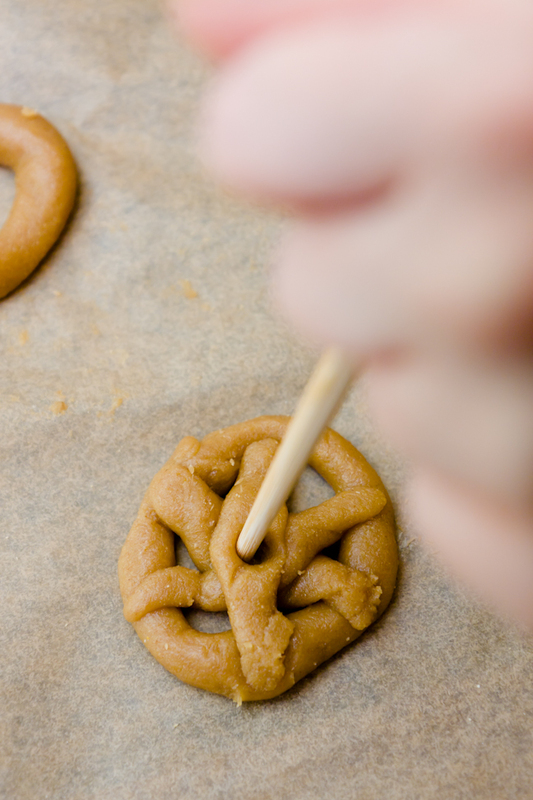 Shape the dough into wagon wheels or whatever other shape suits your fancy. I used a chopstick to help shape the dough (as shown above). The fastest thing would be to simply roll to dough into little logs. Fry the shapes in vegetable oil at 350 F until brown (about two minutes). I did them in small batches since I used my mini deep fryer. I find deep frying to be so much easier and cleaner in the deep fryer vs a pot.